Home › Golf Clubs › What are the Best Golf Clubs for Seniors? As a senior golfer, your swing may not be as powerful as it used to be. That’s nothing to be ashamed about at all. In order to maintain your game, you just need to make some adjustments. One of the best things you can do is to change your clubs. There are many similarities between clubs for seniors and those used by beginners. Pay special attention to the shaft as you will probably need a more flexible shaft to compensate for your slower swing speed. There is a good selection of senior clubs available on the market; here is our pick of the best golf clubs for seniors. The Wilson Profile XLS golf set is genuine value for money and one of the best senior golf club sets out there. If this is around your budget range, you cannot go wrong. The 11-piece set comes with all the basic clubs — a high launch driver, a 3 wood, a 4 hybrid, 5-SW irons, a putter, bag and head covers. The set is lightweight and has vibration-dampening graphite senior flex shafts. They are very forgiving and will have you on the fairway all of the time with very little effort. The larger, softer grips were also designed specifical for the senior golfer to make holding the club more comfortable. The included bag is of very good quality and has handles at the top, sides and bottom that lets you easily move it around. If you are looking to maintain your game or even to make slight improvements these clubs are more than capable. For only $299, the Wilson XLS Golf Set might be the best deal on the market right now! Buy the Wilson Profile XLS Senior Golf Set here! Just want the best? And not too worried about cost? 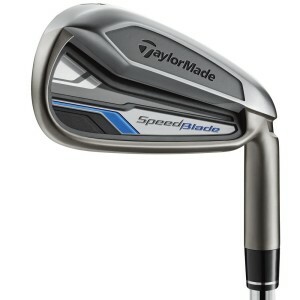 Then these Speedblade irons from TaylorMade could be for you. Their specially designed club faces feature a lower center of gravity, which helps you get a higher ball launch, and longer distance. The other key feature of these clubs is the “Speed Pocket”, a specially designed slot in the sole of club which increases clubface flexiblility on impact. When most golfers mishit a ball, they hit too low on club face, resulting in a significat loss of distance, height and carry on their shots. The Speed Pocket relieves this problem by helping consistently launch your shots higher, and longer, even if you make contact below the sweet spot. You will definitely see an increase in your iron distance when using the SpeedBlade irons. The ball will feel like it is “jumping” off of your club! The only real downside of these clubs is that they are a bit expensive for the average Joe. But, if you want a top-of-the-line iron set that looks amazing, and will definitely help you improve your distance, then these SpeedBlades are for you. Note that this is not a complete golf set — it is just irons. The SpeedBlades are available in multiple configurations. For seniors, we recommend getting graphite shafts with “Senior” flex. Buy the TaylorMade Men’s SpeedBlade Iron Set here! This set is made specifically to suit the needs of older golfers, so was an easy choice for our best golf clubs for seniors list. All the clubs in the set are oversized and have senior flex graphite shafts. This also makes them very light and easy to carry around if you are walking the course. The grips are also specifically designed to help you get a tighter grip on the club. The set comes complete with a high launch 460cc driver, 3W, a hybrid, 6, 7, 8, 9, PW & SW. The face balanced putter lets you easily align and putt with accuracy. 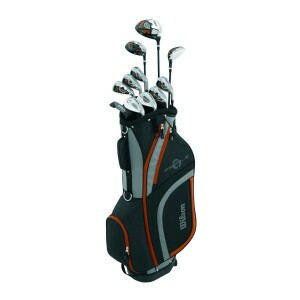 The set comes in a deluxe bag with head covers and graphite shaft protecting system. It has a kick stand and is equally suited to carrying, on a hand cart or strapping to a golf cart. Buy this set on Amazon! Senior flex shafts and easy-to-hit hybrids are the name of the game when it comes to golf clubs for seniors. This set from Adams Golf ticks all the boxes with ease. It includes a large easy-to-hit driver that will have you crushing the ball off the tee with confidence. The 3 and 5 fairway woods are designed with a low profile which makes it much easier to launch the ball in the air when hitting off the ground. The difficult to hit long irons have been replaced by hybrids (4-7). The hybrids also feature Adams’ new “Cut-Thru” slot design which expands your clubs sweet spot to give you more forgiveness on mishits. It will help you hit the ball farther and higher, even if you don’t make perfect contact. The rest of the set is rounded out with an 8 iron, 9 iron, PW, SW and mallet style putter. The clubs are all incredibly easy to hit, and will make your weekly round much more enjoyable. The Adams Idea Golf Club Set is a bit more expensive than your basic beginner-level golf set, but much less than the top of the line brand names (Taylor Made, Nike, etc). At this mid-price range this is easily one of the best complete golf club sets for seniors. Just remember to select the senior flex graphite shafts when ordering! 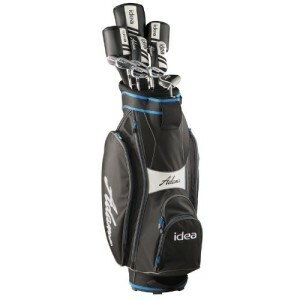 Buy the Adams Mens Idea Golf Club Set here! One of the main issues senior golfers face is a loss of power/distance, especially with their irons. One simple way to mitigate this problem is to replace all your traditional irons with hybrids! This complete hybrid set (3 – PW) from Pinemeadow is the perfect example. The width of the club heads progressively change according to the purpose of the club. The long irons have a fatter base, and are designed to give you maxiumum distance and forgiveness, while the shorter irons with a shorter base were designed for increased control. Each club is easy to hit, and will give you more distance than your tradional irons at lower swing speeds. If you are struggling to get consistent distance with your traditional irons, then you should definitely try out a hybrid set. You will shave strokes off your score, and be hitting like you were in your 20s again! For only $299 (on Amazon), these are also of amazing value, and easily some of the best golf clubs for seniors on the market today. Give them a shot! Buy the Pine Meadow Pre Progressive Hybrid Set here! No matter your choice, any one of our best golf clubs for seniors will allow you to stay at the top of your game and compete with the younger players on the course. ‹ What are the Best Beginner Golf Clubs? Pitching wedge and a driver. 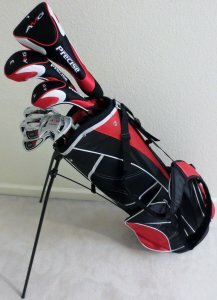 Can I buy these clubs in a set or individually,or at all. Are there women senior clubs? I’am 66 years old and still hit my driver about 240(dead straight 99% of the time). My problem is my irons. I can’t seem to hit the sweet spot anymore, boy what a loss of distance. My irons are about 17 years old (Ping Eye 3). What do you recommend? I know I don’t turn like I use to. I’m a 66 yr old 16 handicapp, looking for a new iron set. Recommendations? Recommendations on a driver with golf swing of 85? Great question! To get better distance on your driver with slower swing speeds, look for something with higher loft (over 12 degrees) and lightweight (senior) shaft.